It ended up being one of those afternoons when just about everything went right for Liverpool, who now know they will return to the Champions League next season with a win over Middlesbrough at Anfield in seven days’ time. The equation is that simple for Jürgen Klopp and his players after an emphatic victory over an abject West Ham side ensured Liverpool remain in control of their own destiny going into the final day. A top-four finish is theirs to lose and it is hard to see Liverpool allowing that opportunity to slip through their fingers on the evidence of this performance, which was full of attacking intent. Philippe Coutinho was outstanding, scoring twice after setting up the first for Daniel Sturridge, who started in the Premier League for the first time since the beginning of the year, and Divock Origi completed the rout with Liverpool’s fourth. The visitors also hit the woodwork three times, registered 26 shots in total and dominated possession in an embarrassingly one-sided contest that rather summed up West Ham’s season. Origi’s goal was the cue for many of the home supporters to head for the exits with nearly quarter of an hour remaining and it was tempting to wonder what the ramifications of this result may be for Slaven Bilic, the West Ham manager. Bilic was aggrieved that his side were not awarded a penalty before Liverpool’s third goal, when the West Ham manager felt Neil Swarbrick should have pointed to the spot after Georginio Wijnaldum caught Winston Reid in the face with a flailing arm, and he may well have had a case. Yet any perceived injustice in relation to that incident was no excuse for some of the abysmal defending at the other end of the pitch, where West Ham were a shambles at times. Liverpool were in the mood to take advantage and by the end the match had turned into an exercise in damage limitation for West Ham, whose players would probably have preferred to remain in the dressing room after the final whistle rather than return to the pitch to acknowledge the small number of supporters who had stayed behind to show their appreciation at the end of the last home match of a hugely disappointing campaign. The scene will be very different at Anfield next Sunday if Liverpool can see off Middlesbrough and secure their place in Europe’s premier club competition. Although it has not been much a fortress for Liverpool of late, with their past three home matches failing to yield a victory, it is hard to see any other outcome than a win against a Middlesbrough side already condemned to the Championship. With Roberto Firmino injured and Arsenal’s 4-1 win over Stoke 24 hours earlier leaving Liverpool with no margin for error, Klopp decided to change the system against West Ham and the Liverpool manager admitted his players took a while to be comfortable with what was essentially a midfield diamond. Indeed they could have been punished in the early stages when Sam Byram, unmarked on the right, dragged a low shot wide of the far post. The biggest scare for Liverpool, however, was just before half-time, when André Ayew filed a contender for miss of the season. Three yards out and with the goal at his mercy, Ayew somehow contrived to hit a post. Incredibly he did the same thing with the rebound. “Absolutely one of the biggest chances I ever saw in my life,” Klopp said. Liverpool were already ahead at that point and yet again it was down to the brilliance of Coutinho. Nathaniel Clyne, breaking on the right, seemed the obvious option when Coutinho assumed possession infield but the Brazilian spotted Sturridge’s intelligent run through the middle. His through-ball was weighted to perfection and allowed Sturridge, played onside by Byram, to scamper clear before skipping round Adrián, the West Ham goalkeeper, and rolling his shot into the unguarded net. It was Sturridge’s first goal for Liverpool since his last Premier League start, against Sunderland on 2 January. On that occasion Liverpool dropped two costly points but there was no chance of the same thing happening here. They started the second half with greater intensity, forcing Adrián into three saves in a couple of minutes, and in that sense it was no surprise when Coutinho scored Liverpool’s second shortly before the hour mark. Wijnaldum’s 25-yard volley rattled the crossbar – Joël Matip had suffered the same misfortune in the first half with a downward header – and West Ham were unable to clear the danger. Coutinho, loitering about 25 yards from goal, took the ball forward before drilling a right-footed shot into the corner. Four minutes later the game was in effect over as a contest when Coutinho got his second. With Reid lying on the floor after his clash with Wijnaldum Liverpool broke away. Coutinho, picking up the ball inside his own half, exchanged a few passes and continued his run. When he got the ball back in the West Ham area there was only going to be one outcome as he danced round James Collins’s half-hearted attempt to stop him before thrashing home from 10 yards. 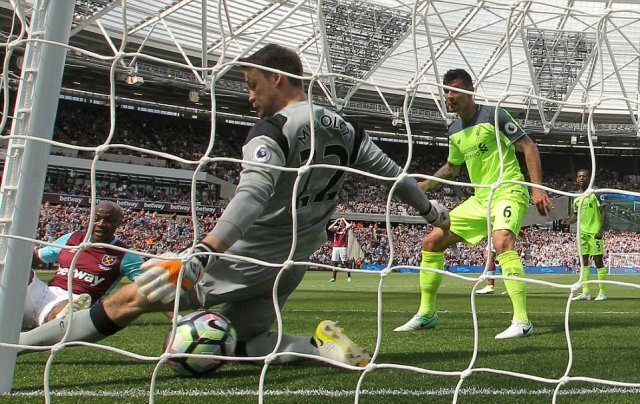 Origi, who had earlier hit the woodwork, capitalised on more woeful West Ham defending to slide in the fourth from six yards.